I'm really like this unit. Use it every morning while reading the news and drinking my coffee. It's so smooth, I can even answer email while peddling. I work at a desk all day long and often look up to discover I've been sitting for four or five hours without moving. This wreaks havoc with my fitness band because it's wearing out its little battery pleading me to get up and move. But now, Cubii. The best part about it is that the Cubii app on the iPhone speaks to the FitBit app, so I get "credit" for pedaling merrily away AND with the adjustable resistance I think the thing is telling the FitBit about calories burned. Who knew it was so easy to get 9,000 steps and still get my work done? 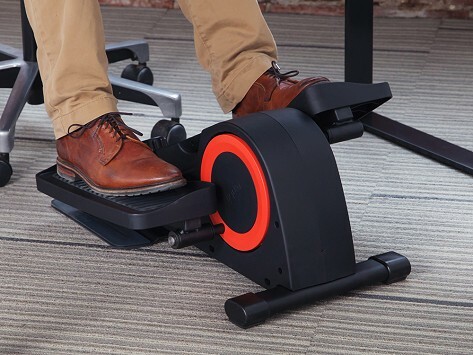 I thought it would be hard to concentrate while pedaling, but I guess it's sorta like the ADHD kids' fidget toys; I actually find myself concentrating better; if I stop for some reason, my feet are still on it and I just say, "Ooops, back to moving," and there I am. The thing is very quiet so my office mate doesn't hear it, it fits under the (old traditional) desk without making me bang my knees. It's a hefty little thing, though once you set it up you won't have to carry it around. I've lost 12 lbs since I got it and didn't even notice. That's MY kind of exercise. I started using mine in January. My job requires 4-6 hours of conference calls per day, so outside the gym, this is my only activity. I started on tension 2, because I wanted something I could do mindlessly. I am now at tension 5, and get disappointed when I travel to conferences and don't have my Cubii while I listen to the speakers. I am considering buying one for home, and if they make one for travel, I will definitely buy one. Love my cubii. Simple to use, easy to put together. 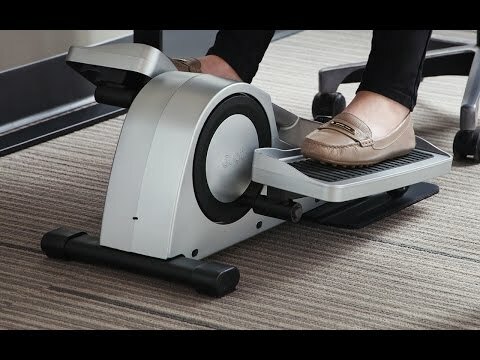 Looking forward to being able to get some exercise while on my computer. I purchased the Cubii for my 95 year old mom and I could not be happier! The Cubii is perfect for my mom to get some exercise and movement in her legs. My mom uses the Cubii everyday. Highly recommend the Cubii! I am using my Cubii right now as I write this. I am so happy with how easily I have been able to fit a little bit of exercise into my day. When I am at the computer or just watching TV, I can pedal away some calories. Accomplishing important tasks while also doing something healthy is great! Due to severe allergies, I can't join up with the neighbors on walks around the neighborhood. I had been looking for an affordable option. Cubii is that and more! I also have a standing desk and an elliptical I use there but I can't stand all day. Cubii keeps me active and energized. I put my Cubii under my desk a few weeks ago and I absolutely love it!! I have paired it with my iPhone to track my progress. I burn about 200 calories a day. I actually did 4.8 miles one day. It operates so smoothly and so quietly I'm not bothering anyone around me. I cannot say enough good things about it. I tell everyone with a desk job that they need one. A year ago I had bilateral (both) knee replacement. Getting my new knees to function properly was a long, difficult task. I had old style "peddles" I was using but could not use them while working because my knees hit the desk. I purchased the Cubii and use it throughout the day. I LOVE it and think it has been significant in getting my knees moving! The Cubii provides a good low stress and low visibility workout. I use it while watching TV. It is quiet enough to use with other people in the room without having to crank up the volume. A typical hour show (about 47 min. on Netflicks) is a simple timing method. The unit is heavy enough that it does not slide forward during use. Check alk of the instructions before attaching the pedals-- the tip on using packing blocks to help brace during assembly is very helpful. So far I am very satisfied with the purchase. It provides a nice alternative on days when the weather makes a trip to the gym difficult.